A satellite TV service with connections to the Saudi government is responsible for the theft of dozens of sports broadcasts from a neighboring country, according to a report. The New York Times reported on Wednesday that Qatar’s BeIN Sports has repeatedly been the victim of piracy after someone within Saudi Arabia redistributed its signals online without the company’s consent. BeIN Sports, dubbed the “ESPN” of the Middle East, is operated by Al Jazeera Media Network, which itself is funded by the government of Qatar. Several Middle Eastern countries, including Saudi Arabia, have led an economic embargo against Qatar over allegations the country supports terrorism by harboring fugitives and dealing with countries like Iran. Last June, Saudi Arabia led an effort that demanded Qatar shut off the Al Jazeera satellite broadcast network. An editorial on Al Jazeera’s website published the following month said Saudi Arabia appeared to be backing down from its demand to close the channel. That may have less to do with concession and more a shift in tactic. The Times reports that for the last few months officials with the government-run BeIN Sports network have been monitoring a new startup from Saudi Arabia called beoutQ, which has been rebroadcasting pirated BeIN Sports signals of major athletic events. The timing of the piracy is problematic for BeIN Sports: Al Jazeera Media Network paid “several billion dollars” to secure the rights to the upcoming World Cup soccer games, the Times report said. The pirate satellite service threatens to undercut BeIN Sports’ legitimate broadcasts in parts of Europe, the Middle East and North Africa by offering an alternate and cheaper way to view the events. According to the Times, the pirate service requires a small set-top box sold in local shops throughout the Middle East along with a $100 a year subscription, which is cheaper than the cost of a sports subscription through BeIN. Al Jazeera Media Networks began investigating the source of beoutQ after being tipped off some of its content was appearing on the service. Al Jazeera Media Network traced the source of the pirate signals to Arabsat, according to the Times. Arabsat is a satellite broadcast service operated by the Saudi government and has been redistributing several beoutQ signals for months. Qatari officials sent a letter demanding Arabsat stop supplying satellite services to beoutQ. Arabsat refused, saying it wasn’t responsible for the content of broadcasts that appeared on its feeds. The case grew worse against the Saudis after subpoenas issued against an Internet company based in the United States revealed a Saudi broadcast executive paid a webhost company for services connected to beoutQ. Recently, the Saudi government banned sales of BeIN satellite equipment and blocked customers from paying their subscriptions, the Times said. Around this time, decoder boxes for beoutQ began appearing in local shops, and the satellite operation geolocked its signal so only viewers inside Saudi Arabia could receive the broadcasts. Officials with the BeIN channels thought it would be easy to track down the pirates because BeIN decoder equipment use digital fingerprints tied to each individual subscribers. But the Times said this method of locating the specific pirate proved difficult because the broadcast hackers had figured out how to disguise their fingerprints. Al Jazeera Media Network says it has filed challenges against Saudi Arabia with the World Trade Organization and other venues over the pirate signals. An official with BeIN Sports told the Times that it could take anywhere from three to five years for their case against beoutQ to be heard in different legal venues, and by then the company would lose a significant amount of money. 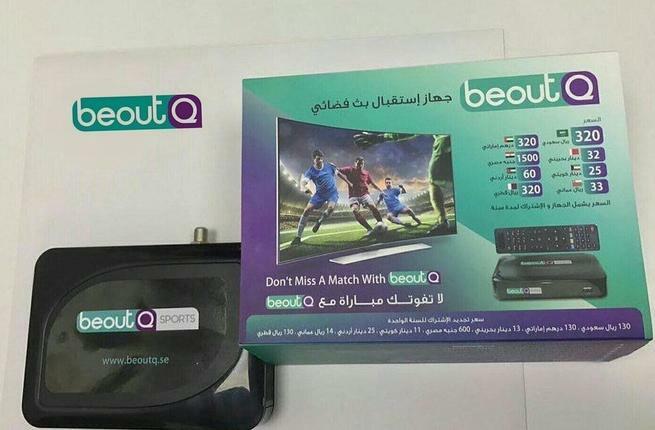 On any given day, beoutQ is pirating between one and two dozen games from BeIN Sports, the report said. BeIN Sports also operates channels in the United States and Canada, though the rights to the upcoming World Cup games belong to other national broadcasters in those regions.